Chevron Amethyst is one of the best stones to work with the Third-Eye, enhancing both intuition and physical vision on all planes of existence. 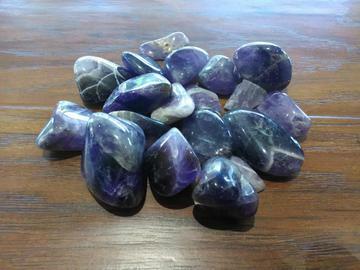 Use Chevron Amethyst to help remove resistance to change, and to dissipate and repel negativity of all kinds. Chevron Amethyst creates a strong healing field around the user, and as such, is a good choice to cleanse the aura and to enhance the immune system. Crystal healers work with Chevron Amethyst for its psychic energies and for its ability to clear and strengthen the aura. Size Range: 1 1/8" - 1 5/8"